Ylläshumina and its surroundings cater for a host of activities in the autumn colours and winter alike. In addition, Ylläshumina’s own knowledgeable and resourceful guides organise a range of excursions and adventures. During high season, the hotel also has a weekly programme for holidaymakers. The experts at Ylläshumina’s ski shop help you to choose the perfect cross-country skis for you to hire and advise you on how to wax and look after your skis. The ski shop also hires out snowshoes and sells a range of useful accessories for conquering the Lappish wilderness. In our Safari House you can choose your adventure: an actionpacked snowmobile- or husky safari, snowshoeing, cross-country skiing or a reindeer ride in the silent forest! We offer various snowmobile safaris where you get to know the area a bit better, and you will see much more than by walking or skiing. 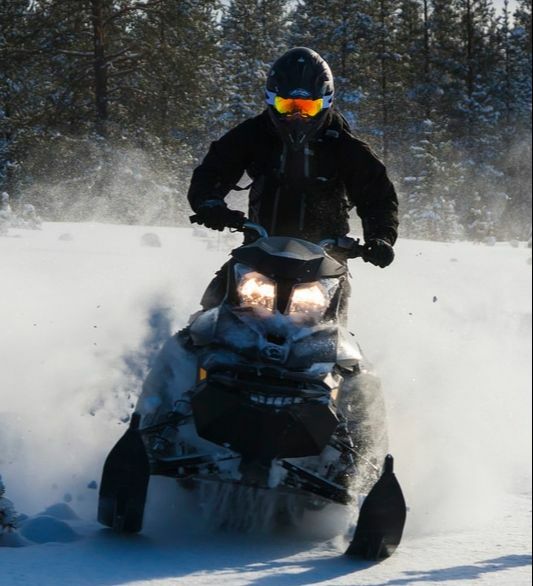 With the snowmobile the sceneries changes quickly and you will enjoy the speed and still fresh air also, as the snowmobiles have nowadays 4-stroke engines. ​Snowmobile tours for min. 2 persons max. 8 persons (weekly programm). For safaris on request min. 4 persons. Children under 12, if they can ride on the snowmobile are half price. For private safaris +30% fee. Half-day snowmobile tour. In the middle of the safari we stop, light a campfire and the guide makes a hot lunch. An easy going safari for anybody who is interested to try snowmobiling. An evening safari after dinner. With a bit of luck we can see the northern lights, and if not, hopefully there is a clear sky above us so that we can make a stop and just be amazed by the millions of stars on the sky. We´ll drive with the snowmobiles to an isolated lake where we have a try how lucky we are with catching some fish. We have a brake and make a fire and eat something before heading back, possibly with loads of fish? On the husky tour you will find yourself in the middle of a fairytail land, driving with the dogs through the snowy forest where you meet no-one else. You are part of the team, and you will be surely amazed by the power and excitement that the dogs have for pulling the sled! Husky tours min. 2 persons max. 10 persons. Bigger families / parties on request. Private tours available on request and according to availability. Transfer to Luosu husky camp. On the husky safari you will be part of the team, mushing and steering a sled of 4-6 huskies. Warm drinks and a snack tastes so good enjoyed on a open fire after the tour. Transfer to Luosu husky camp. For the full day tour each person gets an own team. There will surely be some deep uphills, so be ready to help the dogs, and on the way down on the other side, keep your feet on the brake. Nice scenery, happy dogs and surely an active day out with sporty sleddogs! Ylläshumina guides will take you for a short ”try it out” walk for two hours, or you can join a longer 3 or 4 hours snowshoeing adventures to one of the seven Ylläs fells. You will get the best out of the tour when you can go snowshoeing with a local guide who knows the area really well! Together with the guide you can decide the destination, what is the best to do on today's weather conditions. Pick one of the fells to conquer: Kuer / Kesänki or Kellostapuli. Ylläshumina offers a full service ski rental. Our guides can prepare your skis and with us you can book also a skiing lesson to learn more about the technics for classic and skating skiing. The area around Ylläshumina and Ylläs fell has more than 200 miles (330 kilometres) of ski trails ideally suited to beginners and more experienced skiers alike. The trails lead off directly from in front of the hotel’s main reception building. ​Cross country skiing lessons min. 2 persons max. 10 persons. You can book the ski lesson either on your own skis or with the rental skis. We offer also skiing tours in the Ylläs region. Starting from 1.2. we can do off-track tours as well. Have a talk with our guides and they will give you a nice idea about a tour we could do together! On request we offer a visit at a local reindeer farm, Hannun Ajokhaat with a 3 km reindeer sleigh ride. This is a way to get to know the lappish genuine lifestyle as a reindeer herder, and you will surely hear stories from the past and today of a reindeer herder. After Eight safari upon request. Must be booked separately, ask for more information at the reception.